Just the same as with arepas, in Colombia you will find several types of empanadas. The empanadas made with potatoes and beef are the most popular, and by that I mean they are the ones people make or sell the most. 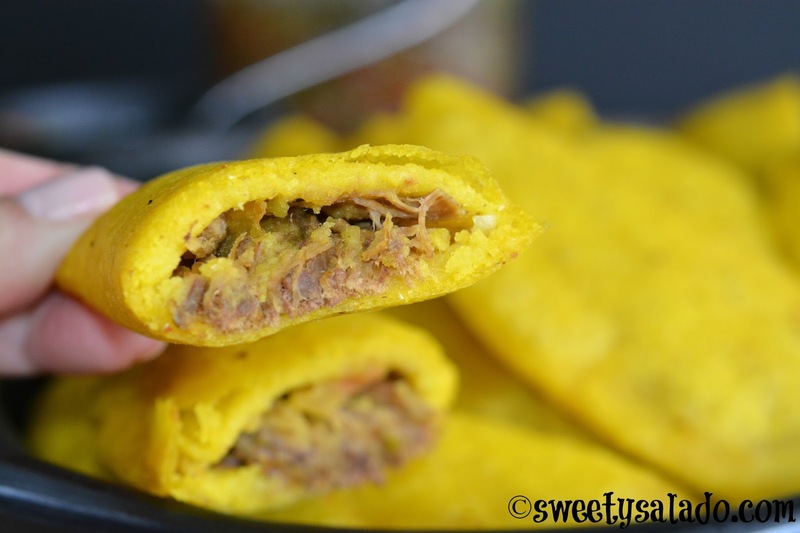 But one of the most delicious are these empanadas vallunas, which come from the department of Valle del Cauca and are made with papa criolla (creole potatoes) and shredded beef. That’s why they are so good. If you live outside of Colombia, try to find frozen papa criolla, and like I have said before, it’s not the best quality because it’s too small and it’s already pre-cooked, but at the end once you mash it, it has practically the same flavor as fresh papa criolla. If you can’t find it at all, then try to use any yellow potato you can get your hands on. 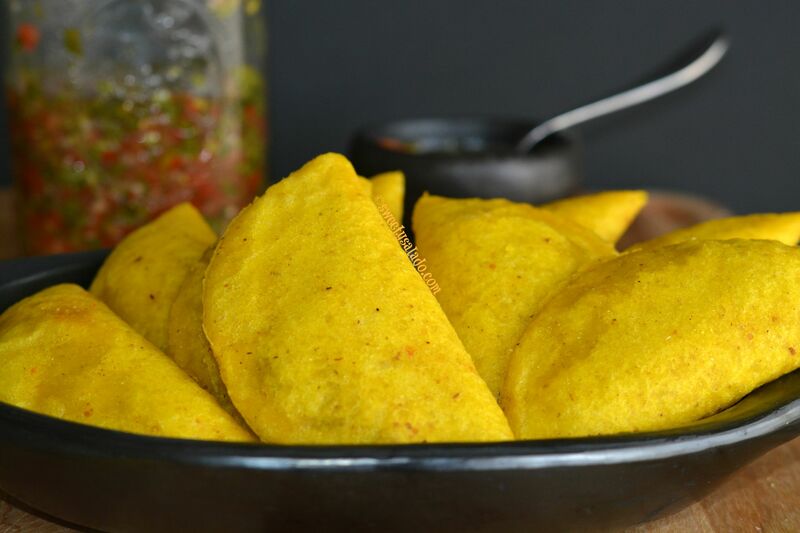 You can serve these empanadas with any kind of sauce and you will find a huge list here on the blog that you can use like the Colombian hot sauce, encurtido, green hot sauce, fast food sauces version 1 and version 2, pico de gallo, and they taste amazing if you serve them with a great guacamole. In a pressure cooker, add the beef, green onion, white onion, garlic, beef bouillon, enough water to cover the beef and season with salt and pepper to taste. Cover and bring to a boil or pressure on high heat. Then, reduce the heat to medium low and cook for 1½ hour if using a pressure cooker, or 3 hours if using a regular pot. To assemble the empanadas, cover a tortilla press with plastic, place a small ball in the center and press. You can also flatten the dough ball with a plate or the bottom of a small pot. Place about 1 tbsp of filling in the center of the dough, then with the help of the plastic fold the dough in half to form a half moon. Press the edge of the dough with your fingers and then make a clean cut around the border with a small bowl or large cup. Continue this process until you are done assembling the empanadas. 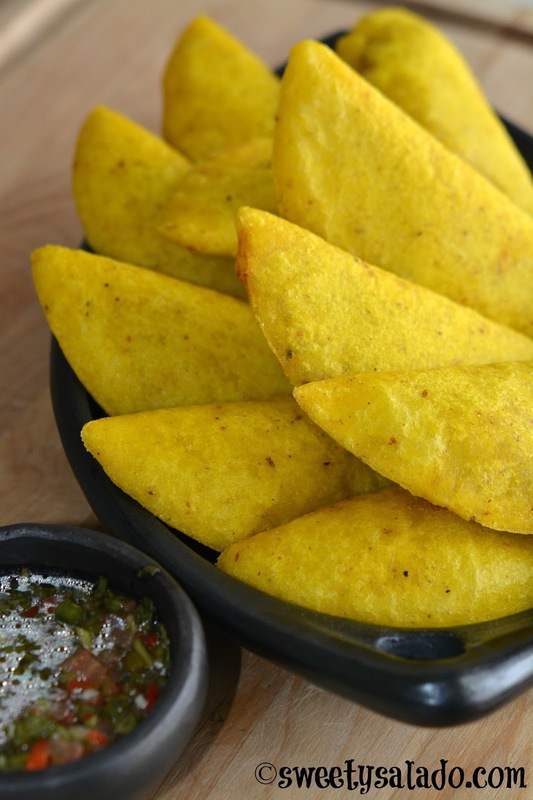 To avoid getting cracks in your empanadas, deep fry them as soon as you assemble them so the dough doesn't dry out. Also, to make them really crunchy the dough needs to be flattened really thin and they will have to be deep fried for much longer, while trying not to get them burnt. This looks wonderfully yumm. Crunchy and testy. The recipe seems difficult, but certainly all efforts are worth the result. Thanks for the detailed instructions.